Dear Santa, won’t you please take this diabetes away? You may have seen this before as I’ve decided I will repost this every Christmas, because, frankly, fun is healing. And if you’re stuck with diabetes, you need as many laughs as you can get! All I’d like this Christmas is for you to take this diabetes away. I’m so tired of it already. All the time stabbing my fingers for blood and guessing when my sugar’s too high or too low. Now that I’m in menopause I can barely tell whether I’m sweating because I’m losing estrogen or because my blood sugar’s crashing at 50 mg/dl! And, can we talk… I mean the constant figuring out how many carbs are in a ravioli or bread stick or that fried calamari that will be at the company Christmas party. Some days I just want to lie down and shoot myself. Please, please, Santa, would you take this diabetes away? I’m very sorry you’re having a tough time during my favorite season. I only want people to be singing carols and drinking eggnog and feeling good cheer. Unfortunately, it says in my contract that I’m not allowed to interfere with life’s natural occurrences. So here’s my suggestion: although you’ve already opened your holiday gifts, go back and look under your Hanukkah bush for the gift in having diabetes. You may have to spend a few days looking, so why don’t you schedule it for the week between Christmas and New Year’s while you have some down time? Then you can start the new year fresh. A gift in my diabetes? What are you, crazy? Meshuggah? Thanks, but no thanks! I seek your wise counsel. 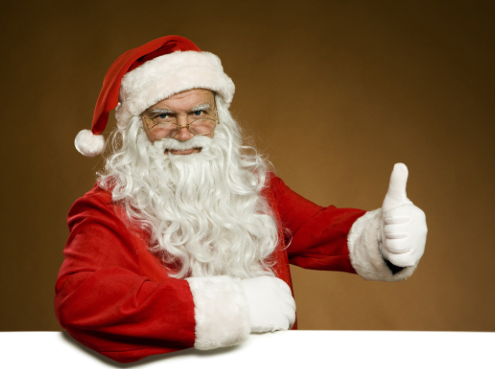 I wrote to Santa to take away my diabetes, but he wasn’t helpful at all. Surely you who have studied the Torah and represent our people who have suffered throughout history can help me with this awful diabetes. It’s such a strain, Rabbi. I have to test my blood sugar when I really want to be lighting the sabbath candles. I forgot all about the High Holy Days this year because I was so busy counting carbs in the Challah, bagels and honey cake. Rabbi, please, what solace can you offer me? What words of wisdom? Surely you would tell me to just forget about this diabetes thing and go shopping, right? Santa and I just returned from the Caribbean, and he told me about your difficulty. He said he told you to look for the gift in your diabetes. I concur with Santa; there are many gifts to be found in diabetes, if you look. For one, my child, you won’t have to drink the traditional Manishewitz holiday wine anymore. The Counsel all agree that it is much too sweet. Bring out the Chardonnay! When Santa asks you to look for a gift in your diabetes, he is not saying this because you are not Catholic and he is not bringing you anything, although this is true. He is speaking like our brothers the Buddhists, who profess that there is a gift in everything if you look for something positive that it can bring into your life. Let me tell you a story, my child. My own Aunt Sheila had diabetes, and after she stopped kvetching, she went to a spa and learned how to eat healthfully. She shopped along Rodeo Drive and bought a cute little jogging outfit and started running. On her jog along the ocean she met her fourth husband, Marvin, and they’re very happy. They just moved into a $6 million mansion in Jupiter, Fla. — right next to Burt Reynolds! Everyone’s plotzing! The house was in foreclosure so they have even more money to decorate! Darling girl, find a gift in your diabetes, because to be honest, since you’re not orthodox, and all I have are these great wigs I got on sale from my cousin Schlomo, I’m not bringing you anything, either. And really, it’s not very pleasant to whine. I thought about what you and Santa said and have decided to become a Buddhist. I picked up the Dalai Lama’s book, “The Art of Happiness.” He says, “Happiness is a butterfly, which when pursued, is always just beyond your grasp, but which, if you will sit down quietly, may alight upon you.” I told my friend Joe I like butterflies, and I like the robe, so these aren’t bad gifts. Joe said the quote meant that we are the source of our happiness, that happiness can only come from inside us, regardless of what happens in our lives. Hmm, I said, maybe I need to learn more. So I booked a flight to Tibet. Now if only I didn’t have to drag all this damn diabetes stuff with me…. ohm… ohm… oy.